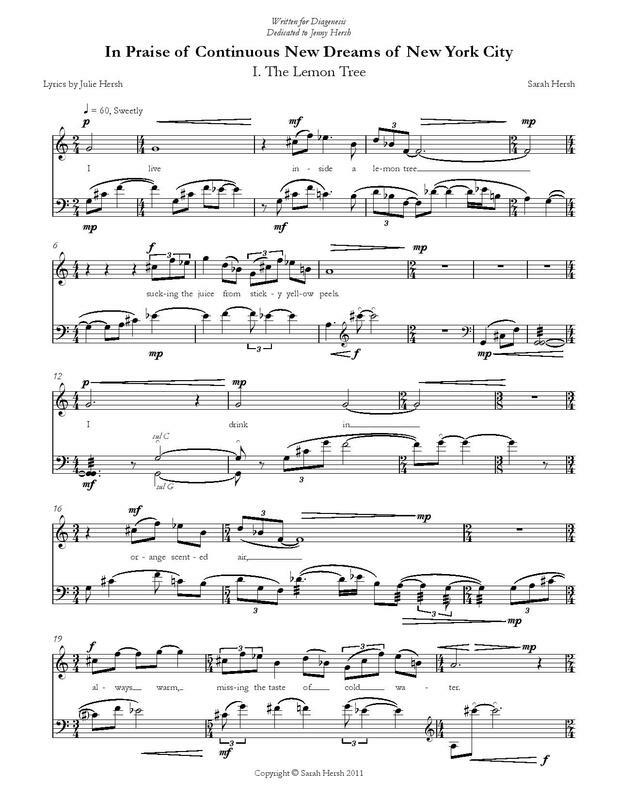 Format: PDF of the score (three movements) emailed manually within 24 hours of purchase. ​In Praise of Continuous New Dreams of New York City was a collaboration with my sister, writer Julie Hersh. The piece is about New York and the sisters' relationships to each other as well as to the city itself. The piece is in three movements: "The Lemon Tree," "The Cafe," and "The Boutique." The first two movements serve as the preface or introduction to the third. Even though these two movements appear first, they grew out of the text for the third movement, which was written first and is based on a dream. Alternately mysterious and strange, playful and fun, "The Boutique" is meant to feel like a dream in the sense that it may not always make perfect sense, but there is an underlying logic. In Praise of Continuous New Dreams of New York City was written for the ensemble Diagenesis. This recording is by Juxtatonal.